Maulana Abul Kalam Azad was a renowned journalist of his time. Disturbed by his provocative articles, the British Government decided to deport him off Calcutta. Despite of his house-arrest and imprisonment, Maulana Abul Kalam Azad continued to write against the anti-people policies of the British Government. He was elected as Congress President in 1923 and 1940. Despite being a Muslim, Azad often stood against the policies of the prominent Muslims leaders like Muhammad Ali Jinnah. Azad was the first education minister of independent India. On February 22, 1958 Maulana Abul Kalam Azad passed away. Maulana Abul Kalam Azad was posthumously awarded, Bharat Ratna, India's highest civilian honor, in 1992. Maulana Abul Kalam Azad was born on November 11, 1888 in Mecca, Islam's main center of pilgrimage. His forefather's came to India during the reign of Mughal Emperor Babar, from Heart, Afghanistan. Azads were the descendent of eminent Ulama or scholars of Islam religion. His mother was the daughter of a rich Arabian Sheikh and his father, Maulana Khairuddin, was a Bengali Muslim of Afghan origins. Khairuddin left India during the 1857 Sepoy Mutiny (Indian rebellion of 1857) and settled in Mecca, where he met his wife. In 1890, He, along with family, returned to Calcutta (now Kolkata). Azad had become totally disillusioned with his Islamic training and found solace in the modernist writings of Sir Syed Ahmed Khan. Maulana Abul Kalam Azad's real name was Abul Kalam Ghulam Muhiyuddin. Maulana Azad had his initial formal education in Arabic, Persian and Urdu with theological orientation and then philosophy, geometry, mathematics and algebra. He also learnt English language, world history, and politics on his own. Maulana Azad had a natural inclination towards writing and this resulted in the great start of the monthly magazine "Nairang-e-Alam" in 1899. He was eleven years old when his mother passed away. Two years later, at the age of thirteen, Azad was married to young Zuleikha Begum. After his return to India from an extensive visit of Egypt, Turkey, Syria and France Azad met prominent Hindu revolutionaries Sri Aurobindo Ghosh and Shyam Sundar Chakraborty. They helped in developing radical political views and he began to participate in the Indian nationalist movement. Azad fiercely criticized the Muslim politicians who were more inclined towards the communal issues without focusing on the national interest. He also rejected the theories of communal separatism advocated by the All India Muslim League. In Egypt, Azad came into contact with the followers of Mustafa Kemal Pasha who were publishing a weekly from Cairo. In Turkey, Maulana Azad met the leaders of the Young Turks Movement. Azad, inspired by the works and commitment foreign leaders, published a weekly, called "Al-Hilal" in 1912. The weekly was taken as a platform to attack the policies of British Government and highlight the problems faced by the common Indians. The paper became so popular that its circulation figures went up to 26,000 copies. The unique message of patriotism and nationalism blended with religious commitment gained its acceptance among the masses. But these developments disturbed the British Government and in 1914, the British Government put a ban on the weekly. Unfazed by the move, Maulana Azad, few months later, launched a new weekly, called "Al-Balagh". Failed to put a prohibition on the writings of Maulana Azad, the British Government then, finally decided to deport him off Calcutta in 1916. When Maulana Azad reached Bihar, he was arrested and put under house arrest. This detention continued till December 31, 1919. After his release on January 1, 1920, Azad returned to the political atmosphere and actively participated in the movement. In fact, he continued to write provocative articles against the British Government. The implementation of the Rowlatt Act in 1919 added fuel to the fire and raised the intensity of the participation of common people in the nationalist movement. Consequently, thousands of political activists had been arrested and many publications were banned. During the violence that erupted following partition of India, Maulana Azad assured to take up the responsibility for the security of Muslims in India. Towards this, Azad toured the violence-affected regions of borders of Bengal, Assam, Punjab. He helped in establishing the refugee camps and ensured uninterrupted supply of food and other basic materials. It was reported that in the crucial Cabinet meetings both Sardar Vallabhbhai Patel and Maulana Azad clashed over the security measures in Delhi and Punjab. The role and contribution of Maulana Abul Kalam Azad could not be overlooked. He was appointed as India's first Minister for Education and inducted in the Constituent Assembly to draft India's constitution. Under Maulana Azad's tenure, a number of measures were undertaken to promote primary and secondary education, scientific education, establishment of universities and promotion of avenues of research and higher studies. 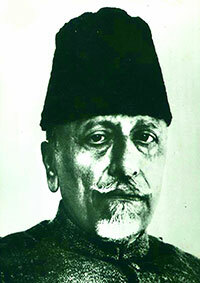 On February 22, 1958 Maulana Abul Kalam Azad, one of the foremost leaders of Indian freedom struggle passed away. For his invaluable contribution to the nation, Maulana Abul Kalam Azad was posthumously awarded India's highest civilian honor, Bharat Ratna in 1992.